Othon first came to our attention with his debut album Digital Angel, released on David Tibet's Durtro label. Tattooed and pierced, he appeared adorned with wings on a plinth, embodying the spirit of the Digital Angel. Digital Angel elicited stunning contributions from the guest vocalists that included Marc Almond and Current 93's David Tibet, alongside the broad range of cabaret entertainer Ernesto Tomasini. Tomasini, Othon's main collaborator, is an artist and actor in his own right whose impressive background has included everything from avant-garde performances to West end productions. Greek born and London based, Othon is a songwriter and pianist. His music embraces classical, cabaret and theatre, informed with a hedonistic, sensual feeling drawn from the gay clubs of London. At the same time the music of Othon can be quietly contemplative perhaps due to his interest in meditation and yoga. 2011 saw the release of the limited cassette on the Touch side-label, The Tapeworm. Silky Hands Of A Rough Piano Boy featured Othon's touching renditions of classical pieces performed on the piano, alongside some early live performances of dramatic opera. Although a minor release it was further evidence of Othon's unmistakeable talent. 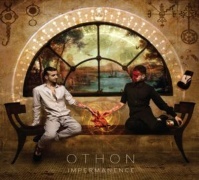 2011 also marked the release of Othon's second full-length album, Impermanence - released on the Cherry Red Records, side label, SFE, home to releases from Marc Almond, David McAlmont and Eartha Kitt. Featuring a larger ensemble, Impermanence, once again featured Ernesto Tomasini as Othon's key vocalist, alongside vocal contributions from Marc Almond, and the acclaimed interpretive singer Camille O'Sullivan. Other guests include guitarist Justin Jones (And Also the Trees), vocalist Beverly Crome (The Cesarians) and the Elysian Quartet. A wondrous, wonderful releases of singular beauty, Impermanence was Othon's meditation on the nature of life, and the acceptance that "everything withers and everything dies". Aside from the above releases Othon has been involved in an array of projects. At the behest of Current 93's David Tibet, Othon was involved in a live scoring of Derek Jarman's The Angelic Conversation, with the late Peter Christopherson of Coil. The beauty of Othon's rendition of 'The Dreamer Is Still Asleep' during rehearsals brought Christopherson to tears. Othon has also provided a live score to Jörg Buttgereit film and provided soundtracks to performances from Ron Athey. At one event, he was hypnotised and performed a piano piece wearing boxing gloves. Othon may well find affinity with outsiders but he possesses a warmth and a compassion that is universal. Othon is destined for greater things, and I can't wait. Compulsiononline caught up with Othon, and even though he was home in Greece visiting family and friends he took timeout to answer the long list of questions we fired off to him. A true sweetheart, we're overjoyed to feature his work here. You studied piano from quite an early age, could you tell us about this and what attracted you to the piano? I was 4 when I started and so too young to remember but I know that I was obsessed with music. My first memorable present was a brand new record player in which I could play my brand new records. I still remember getting it from the shop and this was when I was about 3! I am told that before my parents bought me the piano, I would spend hours on the pianos of their friends being totally unsociable and very noisy. At 15 or so, you began experimenting with your appearance with body piercings and changing your hair colour. What prompted you? What were your influences at the time? What music were you listening to? Funny enough, it all started with a teacher my parents hired in order to help me with maths and physics, as I was crap in those subjects. He was a really cool guy and had an amazing musical education, which inspired me also to be more attentive at the lessons and get better. He introduced me to the records that changed my life: Virus Meadow and Farwell to the Shade by And Also The Trees, the compilation Staring at the Sea by the Cure and some early Cave & Birthday Party amongst others. Then I "initiated" my best friend at the time to the new magical world I had just discovered and together we bought records after records of amazing music. We spent hours on end listening to music and soon started exploring the underground scene of Athens. We became increasingly more reclusive and I, in particular, found great pleasure in shocking my schoolteachers and fellow students both with my look and my behaviour, which somehow didn't match. Did your appearance cause you problems? Yes, both in school and in the Greek conservative musical word. Once I realized how intolerant people were, I only wanted to do one thing: to push the envelope more, whatever the cost! This allowed me to study and understand human psychology - how small, how limited and limiting people are, how we like to feel accepted and how we project to others our own fears of being insignificant. I discovered how easy is to marginalize people and how easy it is to become marginalized. And then you moved to England. Why? I came to study piano at the Royal College of Music. Interestingly enough, I didn't come to England to escape, as many other kids did, though, thinking about it, I had many reasons to do so. Silky Hands of A Rough Piano Boy documents two tracks from a 2006 performance. The tracks of dramatic opera are quite unlike other Othon releases. Could you tell us about this performance and how representative were they of Othon at this time? These tracks come from my student years at Trinity College of Music. I had only started writing recently so those were two of my very first pieces. Shona and I performed them for my degree recital at Blackheath Halls and these recordings are actually taken from that concert. These two songs, together with some other unusual pieces (including the dramatization of an Enochian spirit invocation "sung" strikingly by Ernesto Tomasini and accompanied by several percussive instruments), caused quite a stir! These pieces WERE Othon at the time. At what point did you meet Ernesto Tomasini? Were you aware of his work? Was he aware of Othon? It was in 2005 I think when I saw Ernesto performing at London's underground temple known as Kaos. I was instantly under his spell and went to meet him straight after. I was aware of him from some performances he did previously at Torture Garden but never saw him performing live until then. I found Ernesto incredibly magnetic, both as a performer and a person. We liked each other instantly and we hit it off immediately. He was not aware of me then as a musician though not many people were at the time. Ernesto Tomasini takes the role of main vocalist on both Digital Angel and Impermanence. Is it an ongoing collaboration now? What's it like working with Ernesto? How important is Ernesto to Othon? Ernesto is HUGELY important to Othon. He inspires me, complements me and gives life to my music! He also appeared in just the perfect time for me. There are not many people like Ernesto around, so fearless, unique and incredibly talented! Working with him is just perfect. He likes to work hard and keeps a nice balance between seriousness and play. I am hoping that this collaboration will last as long as we last. Digital Angel also features Marc Almond. How did you enlist the involvement of Marc Almond? Were you a fan of his work? How did it feel performing with him? Gosh, I was a fan of Marc Almond from those early intense adolescence years I mentioned earlier. I could never imagine that I would meet him in person and become his friend, let alone write music for him! I still find it hard to believe sometimes, though lately, a few things have happened that are hard to believe. Performing with Marc is really great as he is what I imagined him to be only better. Marc is used to working in a different way than me but this is actually a good thing as we both learn a lot from each other. 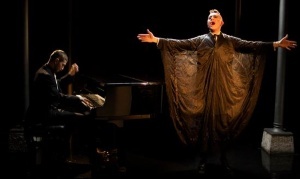 On Digital Angel, Marc Almond sings 'The Tango Song', a song originally written by occultist Aleister Crowley. Digital Angel credits Hymenaeus Beta and the O.T.O. How did you come to interpret 'The Tango Song' and what's your connection to the O.T.O.? I studied Crowley for a long time and got initiated in the O.T.O. about 10 years ago, though recently I have become inactive. Hymenaeus Beta asked Marc to record 'The Tango Song' for some sort of Crowley related CD together with Crowley's grandson who is also a pianist. Marc asked me to help him by doing a demo for him to practice and when he heard my version he really liked it, so he asked H.B. whether it would be OK to do the song together instead. H.B., being as nice as he is, agreed not only for me to do it with Marc but also to put it in my debut album! I'm intrigued by the track 'The Epitaph of God' on Digital Angel. Could you tell us about this track and the themes it touches upon? This is a very dark and twisted song written in a dark period when I was dubbing with crystal and I was seeing self-destructiveness all around me. Parts of it refer to intense sexual experiences, others are full of anger. I must have written it during one of those horrible comedowns though I can't tell for sure. The invincibility mentioned in the song refers as much to the (apparent) invincibility and transformation that one feels with the practice of sexual magick but also to that induced by the aforementioned chemical substance. There are Thelemic references throughout the song. Digital Angel has an intriguing concept about digital implants. Could you expand on this? Do you fear the onset of 2012? This comes very much from my Pentecostal background and the Revelation prophecy about the Antichrist and the Mark of the Beast. I don't really fear about the religious side of the prophecy though I do think that there is a danger for losing even further our privacy and our liberties. Regarding 2012, I am not afraid by its onset at all, if anything I am excited. I don't believe that something catastrophic will happen though, of course, I can't exclude this possibility. What I do believe though is that we are in a transitional period, in which time moves much faster than we realize. Decisions we make now are vital for our evolution as species as well as for our own survival. I do think that 2012 is an important year, however, so I am going for a Shamanic trip in the Brazilian jungle, in order to get in touch with some Tribal Elders, participate in ayahuasca rituals and connect further with my psyche and consciousness. Digital Angel also features David Tibet of Current 93 and was released on his Durtro Jnana label. How did you become involved with Tibet? Were you familiar with Current 93 and related artists such as Coil, Death In June? Why specifically did you choose to cover Coil's 'The Dreamer Is Still Asleep'? I have been a Current 93, Coil and DIJ fan for years. Working with David Tibet was another of those "unbelievable" moments, though it all makes sense somehow; I strongly believe in magnetism and the law of attraction, and so, for me, it is natural that when I want something strongly and I ask for it, I get it! It so happened (by "chance") that the first time I performed, not as classical a pianist but as Othon, David was also performing at the same event with Maja Elliot and he was in the audience listening before they came on stage. He told me afterwards that he really enjoyed it, which made me super-happy and a few days later I got an email saying that he wanted me to do for him a cover of 'The Dreamer Is Still Asleep', a song that was particularly prophetic about John Balance's death, who had passed away only recently. I read that you were involved in performing a live score to Derek Jarman's The Angelic Conversation with Peter Christopherson, David Tibet and others. Could you tell us about this performance? How did it come about? Was it recorded? David got in touch with me about this after talking with Sleazy about it. It was a beautiful experience as I got the chance to work with yet another one of my heroes and to meet an incredibly generous, kind and luminous human being. Unfortunately, the performance never got recorded though there are clips of it on youtube. 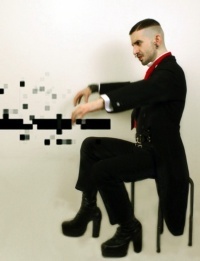 Othon has been involved in a number of projects: live scores for Derek Jarman and Jörg Buttgereit films, soundtracks for Ron Athey performances, and contributed to a soundtrack for a Bruce LaBruce film. That's an impressive list of projects. How did you become involved in these and what attracts you to these projects? Again, I get to attract people and projects I like and similarly, other likeminded artists tend to attract me! Before I met Ron I saw many of his performances and I was deeply moved by their intensity, emotion and, interestingly, "purity". Eventually we got to meet each other, as Ron happened to be in the Derek Jarman performance in Italy mentioned earlier (another one of those "coincidences"!). Soon we started working together and we became really close friends since. I think that a number of collaborations were meant to happen and some of the ones you mentioned are certainly amongst them. Othon's music is both dramatic and theatrical blending opera, classical, cabaret, pop music... Do you see Othon in any musical lineage? Who are your musical influences? I don't really see myself in any lineage though I have been greatly influenced by numerous musicians. When I was a piano student, I was told several times that I was a Beethoven-type of a pianist, cause my heavy and sombre style of playing suited his music. To him, Mozart and the great classical composers, I owe the sense of structure present in my pieces. Bart�k's percussive rhythmic writing and Chopin's melancholy have also affected me deeply. One of my favourite bands as a young boy was Black Sabbath, so to them and later on Current 93, SPK, In The Nursery etc I owe the darker shade present in many of my songs. To composers like Manos Hadjidakis and Janis Christou I owe the Greek and experimental elements of my music respectively. Elvis, Paul Anka and The Mamas And Papas are responsible for the more retro sound. Marc Almond, And Also The Trees and all the other artists I mentioned in the previous questions have played a great role to the development of my musical language. Dance music like early underground disco and hard techno are definitely a major influence too; grounding primal beats have provided for many cathartic dancefloor experiences! The list goes on and on. Fashion and clubbing appear to be an influence on Othon but would you consider recording a more electronic dance style track? Definitely, in fact I am doing that right now! You refer to your music as Pan muzik? What do you mean by Pan muzik? Did you find other terms for your music limiting? Pan means 'everything' in the Greek language and similarly, Pan muzik is an all-inclusive genre that defies limitations. As my music can be this, that or the other, even though always shaped in my own personal style, it seems a very appropriate term to use. 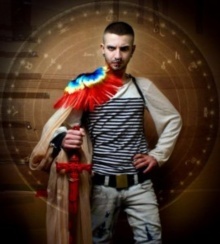 Pan, also, is a Greek God though he is not considered to be one of the main Olympian Gods. He is the God of revolt and wilderness, the party-God and the anti-hero and a God I have always sympathized with. I can happily associate with Pan and what he stands for, and so, combining the meaning of the word with what the actual God represents, I found the perfect name and energy-match for my music! How would you respond to being referred to as a "gay artist"? The idea of Pan is somehow embedded in all other aspects of my life, apart from my music. I find the terms "gay" or "straight" quite limiting as each one of us has his or her own masculine and feminine side, one more developed than other. These two polarities can also fluctuate with time and, in my case, this is certainly happening. I would say that I am a "pansexual" man and an artist that has his long gay periods, his bisexual spells and his straight moments, all of which I am happily embracing and enjoying. I've never witnessed one of your performances, could you describe it? And do tell about the composition you made for piano wearing boxing gloves? It is hard to put my thoughts into words really, as I think that our performances impact the emotional world, first and foremost. What I can say is that there is a definitive drive, energy, intensity (lots of it!) and a huge spectrum of colours. Even if there is just a piano and voice on stage, the variety in the moods, atmospheres and tension is enough to keep the audience on the edge of their seats throughout the concert! Regarding the boxing gloves, I have written two pieces so far, in which I need to wear them to play, and I also did whole shows with Ron Athey with the gloves on and while in trance. The idea came to me initially cause I love the aesthetics of boxing gear and thought that would be fun to try to play with the gloves on. It seemed impossible in the beginning, so I started bashing the piano around until eventually I could play expressively and even hit single notes, as in Dancing Horse, which we premiered in London last November. In addition, playing with boxing gloves offers the possibility of hitting bigger clusters of notes and heavier, without the risk of injury, though you may end up breaking the piano! Impermanence seems to be concerned with the passing of all things. Yes? Do you fear death? I don't fear death though I am still not sure how I well I will deal with the deaths of the people I love. Meditating on Impermanence though has certainly made me stronger. Compared to Digital Angel, Impermanence features a wider assortment of instrumentation and orchestration. How did you compose for a larger ensemble? This was one of the big challenges of Impermanence, as I hadn't really orchestrated or produced much prior to that. I am always up though for conquering big challenges, if there is a good reason to do so, and so I set myself to work as soon as I had the vision of how my second album should sound. Thankfully, I very much enjoyed the process and the writing of the different parts came pretty effortlessly. Orchestrating requires a set of all kinds of different skills to that of composing, as well as good knowledge of the individual instruments, but it can be equally creative and fun. And you got to perform on a Steinway piano. As an accomplished and experienced pianist how did that feel? It feels great though I had the luck and blessing to perform several times on beautiful Steinway pianos in my life, some better than others. I'm touched by the track "All Is Too Soon' which you sing. It is extremely moving. Care to provide some background on this? 'All Is Too Soon' was written as soon as I found out about the death of my old friend mentioned in one of your first questions. Together, when young, we became the black sheep of our neighbourhood and grew up in our own bubble, exploring the dodgiest parts of Athens and the city's seedy nightlife while our other schoolmates would hang around in the same boring cafes doing the same boring things. Unfortunately, Nikos took things too far and gradually became a tranquilizer addict and later on a heroin addict, who was hardly communicating with his environment. Though I am not against living on the edge, I don't condone addictions and especially addictions that are so self-destructive. Eventually, I consciously stopped seeing him, as there was no hope for either interaction or continuation of our friendship. He was found dead a few years later in a little park right across the flat I used to live in Athens.